This research questions how increasing the awareness of college students on topics such as military action and foreign relations affects how the United States conducts peacekeeping. Although there is much research available on topics such as the growing disconnect between the military in America and civil society and the media's influence over public opinion, there is very little information on how these issues have influenced each other, how they have affected our youth, and how peacekeeping operations are conducted throughout the world. How have we gotten to where we are today in terms of peacekeeping and what can we do to improve those conditions? To discover how college students view peacekeeping, a survey was made available on survey monkey in which students answered questions about what they thought would be the most successful forms of peacekeeping, and why or why not they thought education should be increased on this topic. The survey received very positive feedback, with unanimous support for increasing education for a variety of reasons. These findings reveal the need for more research and more action regarding increasing awareness of college students on military and foreign affairs. The need for multi-lateral cooperation between nations has never been more critical for our modern society. What can we, as a people, as a government, and as a nation do to prevent future wars and keep the peace? The concept of "peacekeeping" is a relatively new expression and therefore there is not much research and not much history about the topic. However, peacekeeping has increasingly become a more relevant topic to be discussed in the media, schools, and everyday conversation. "States frequently resort to armed forces with various self-interested and humanitarian goals" in mind (Pekson, 2012). This frequent turn to military action to solve humanitarian goals has led many Americans and top officials to turn to the military when trying to stabilize peace in a region. This has encouraged Americans to become desensitized by the constant reporting of American military personnel intervening in a varying array of conflicts throughout the world. What can we do to move forward? "Knowing the truth has the ability to set one free" (Phinney, 2011). Education is a very powerful tool. Used correctly, it can help improve the world we live in today. Peacekeeping doesn't just fall under the responsibility of the government anymore. As life among society has evolved, as war has evolved, so have the responsibilities of citizens worldwide. A lot of programs involving increasing education are targeted to undeveloped nations. However, there are little to no programs targeting the youth, specifically for high school to college age students, in the developed world. Increasing awareness of American college students on topics such as military and foreign affairs has the potential to revolutionize the way we conduct peacekeeping in our future. This topic was inspired by the author's affiliation with the Darfur Dream Team, a peacekeeping organization within the United Nations Refugee Agency (UNHCR). The Darfur Dream Team funds schools in Sudanese Refugee Camps in Darfur. Their goal is "empowerment through education." Sudan has been ravaged with genocide since 2003, resulting in nearly four million people fleeing their homes, most to the Darfur region on Sudan's western border. The Darfur Dream Team's aim is to educate children in the refugee camps, believing that education on the issue of what is happening to them will empower them to create stability in the area without violent retaliation and more death and pain. Experience within this organization has inspired a powerful movement and a powerful precedent for future peacekeepers in the world. The Darfur Dream Team has found great success in its program. Right now, we can only imagine what could be accomplished if more programs like these were expanded and brought to different areas of the world. This research focuses on the potential programs like these if placed in an American college setting. Most research related to this topic focuses on how and why war has evolved, as well as on different forms of peacekeeping operations and the media's role in it all. This research aims to show how peacekeeping and media influence each other and influence America's future. The following section reviews literature on the topic, including the evolution of war, the media's influence over public opinion, and different forms of peacekeeping. The next section discusses the author's methods of collecting data on how American college students feel about the topic and whether or not college students would support more forms of education on the issues presented. The research concludes with an analysis of the results of the study and a discussion of how we can move forward. There is already much research to support that war and the use of military intervention have evolved over time. Americans may not directly feel the effects of war as we have in our past. This has led to a growing disconnect between military action and civil society (Peterson, 2013). People may be less aware of what our military is really accomplishing for a variety of reasons. There is plenty of data about why and how war has changed, however there is not much information on how this has affected our youth. Is the average American college student aware of international affairs? Does the average American college student know or hear about America's position in the international community? How can we improve awareness of America's future in topics such as military action and global relations, and how can this impact how we find peace in the world? The official definition of peacekeeping established by America's Department of Defense and recognized by the United Nations is "military operations undertaken with the consent of all major parties to a dispute, designed to monitor and facilitate implementation of an agreement [cease fire, truce, or other such agreement] and support diplomatic efforts to reach a long-term political settlement" (Gortney, 2010). The official definition of peace enforcement is the "application of military force, or the threat of its use, normally pursuant to international authorization, to compel compliance with resolutions or sanctions designed to maintain or restore peace and order" (Gortney, 2010). Although these definitions describe the implementation of peace, they each involve military action. Why is that? Why is the military involved where peace is desired? To understand why Americans have come to define peace through the military, we must first examine how America has used war and military intervention in the past, and how it has evolved over time. War has been recognized as an inevitable part of society, ignited by competition. Studied and debated since the beginning of philosophical thought, Aristotle long ago established that war is only justified if it is used to find peace. This Greek ideology has shaped European concept of war through the ages (von Elbe, 1939). However, while nations have used this dogma to justify war in the past, in modern age there are new technologies and therefore more lives at risk if war were to be declared. To exemplify how war has evolved, during World War II there were two front lines—one on the battlefield and one at home. Every civilian felt the impact of war, and a spirit of cooperation, unity, and generosity impelled everyone to work together, save money, and contribute to the war effort (Erenberg & Hirsch, 1996). Nevertheless, as technology advanced and the amount of actual soldiers on the front lines of battle decreased, the war effort continued to be felt less and less at home, thus stimulating less of a societal reluctance to go to war (Peterson, 2013). Popular media outlets have been suggested as a major contributor to the growing disconnect between military actions and civil society because of the small amount of sovereignty they have over what they do and do not cover. There is a well-known bias that exists within different news companies, so it is suggested that the public's opinions on events are skewed based upon their chosen news provider (Cotton, 2010). Media coverage of Vietnam is marked as a critical turning point in the history of American journalism (Fielding, 2012). The strength of anti-Vietnam sentiments as publicized by the media is an example of the power the media has over public opinion and of the potential America's youth has to influence foreign and military policy. Known as the "living room war," the government did not know how to censor and regulate the media and its anti-war coverage during the Vietnam War, resulting in a completely different system of reporting after the war was finished (Phinney, 2011). This new system involves news outlets that have no power over what they cover and how they cover it. Thus, resulting in Americans not having available to them what the military is doing, where they are, and why. This lack of information has contributed to the growing disconnect between military action and civil society (Peterson, 2013). Once more people are educated on these issues, one may ask, what can we do next? How can we improve these situations and influence how America conducts peacekeeping operations? The term "peacekeeping" wasn't invented until the late 1950's (Bellamy & Williams, 2010). This concept is a relatively new phenomenon and therefore not much research has studied the topic. The complexity of peacekeeping has changed over time. Different nations recognize different forms of keeping the peace, and therefore must be treated differently according to a particular country (Bellamy, 2010). The role of who is in charge of keeping the peace has changed and evolved just as the war effort has evolved. It is no longer the sole responsibility of a nation's government to maintain peace; peacekeeping now relies on various peacekeeping organizations and other NGO's and non-profits (Durch & Berkman, 2012). What could be accomplished if the responsibility of peacekeeping was broadened past the realm of independent peacekeeping organizations, the military, and the government? How can increasing the awareness of college students on foreign and military affairs in the United States affect how we achieve international peace? Kofi Annan wisely said, "Education is, quite simply, peacekeeping by another name" (Mwanza, n.d.). Bringing awareness to college students about these issues has the potential to generate a more mindful and educated future for the international community, which can lead to a more stable and peaceful society. The most important aspect of this study lies in the answers to a survey available to college students on survey monkey. This survey collected demographics such as name, age, level of education, etc. The survey began with three questions of which participants must rate three things from one to ten: first, the students rated how important they thought the issue was; second, the students rated their individual awareness of the issue; and third, the students rated how often they personally thought about such issues. Next, there was an open ended question in which the participants were asked to state whether this topic and the issues involved should be discussed more in places such as schools and in the media and why. Lastly, the participants answer a multiple-choice question asking what they perceived as the most successful form of peacekeeping. The results of the survey were analyzed, specifically comparing how often the average college student thought about this issue and his/her opinion on the most successful forms of peacekeeping. The survey determined how college students thought about this topic, whether they were aware, and did they even want to be aware? By providing a space for discussion of individual opinion on the topic, the study sought to find what college students thought about the topic and to generate support for receiving more education on the issues. The following graphs outline the findings of the survey in the order they were questioned. 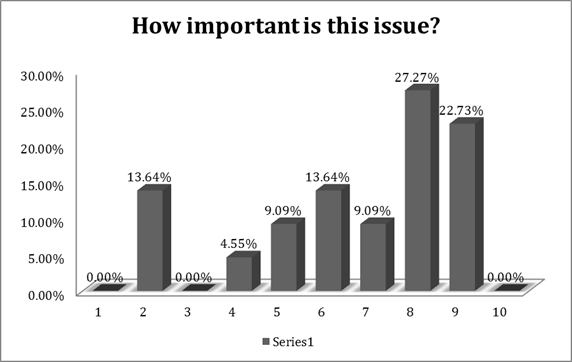 Figure One represents the answers when students were asked to rate the importance of the issues presented from one to ten, one representing very little importance and ten representing major importance. 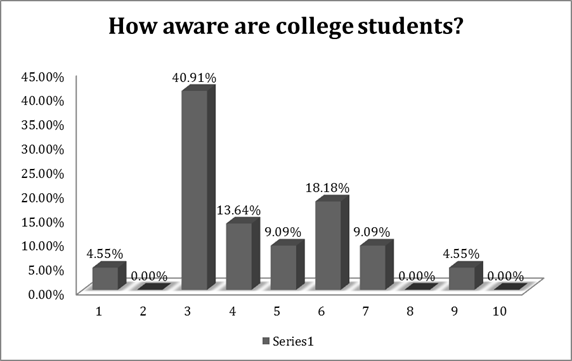 Figure Two represents how students rated how aware they believed fellow college students to be on the topic, one being not aware at all and ten being well informed and very aware. Figure Three represents the responses of students when asked to rate from one to ten how often they personally thought about the issues presented, one meaning they rarely thought about the issue or never at all and ten meaning they thought about the topic very often, sometimes more than once a day. 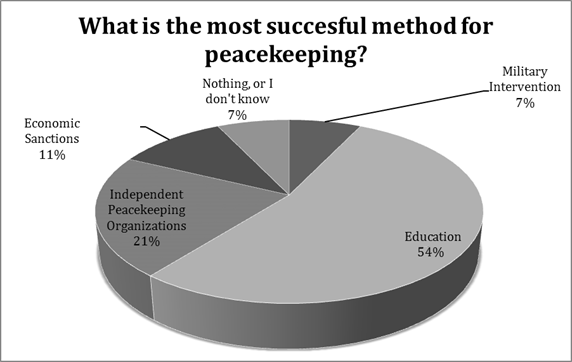 Figure Four represents the answers when students were asked what they believed to be the most successful method of peacekeeping. Figures One through Three illustrate this sample's general awareness and outlook on the issue of peacekeeping versus military action. 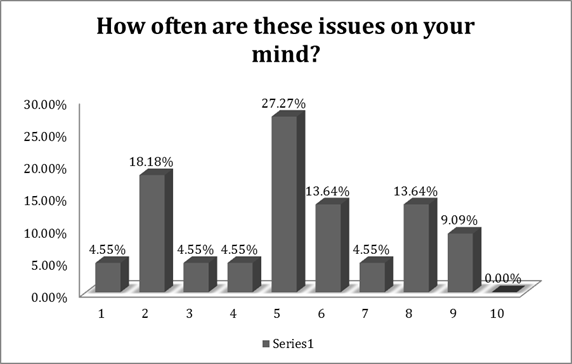 Figure Four supports that, although this sample population isn't thinking about this issue very often nor is very aware of the issue. Education is overwhelming thought to be more so than anything else the most successful method to keeping peace.Based on these findings, the majority of the participants of this study find knowing about military and foreign affairs to be a very important topic; however a majority also doesn't find themselves or others very aware of it. This sentiment was also reflected in the written responses of the last question of the survey, which asked, "Do you think [these topics] should be thought about and discussed more? Why?" Unanimously, every participant of this survey responded "yes," with different explanations as to why. Although the participants were only given a small abstract about this research, their passions and opinions shined through when given the chance to elaborate on their feelings on the topic. With some explanations as simple as "knowledge is our biggest weapon," wide support for increased education in any subject that could potentially give people more knowledge about their future and how they can contribute to society were evident throughout all responses. The general theme found amid these written responses was the participants' acknowledgment of the potential education has for the future of the United States. Our youth believe in that potential and support using education to better the world. One participant responded, "There's always going to be problems… being aware of the problems is a way to change them." If we educate people, specifically our college students and our youth, on the problems experienced by the less fortunate around the world, innovative and more effective methods to handle those problems could be discovered. Another respondent stated, "Education is imperative to citizen's developing their opinions, and if necessary, rise up to challenge the government's current tactics." Without education, we cannot come up with new ideas; we cannot develop our own opinions and share them with others who can hold an intelligent debate to spark more opinions and more ideas on how to help others around the world. Another responded, "When the time comes, this generation needs to be educated and understand what they could vote for or even propose." This response suggests more education on our rights—what we as ordinary citizens can do. We are the future of America; "when the time comes," students are going to need to know what they can and cannot do in order to better the society in which they live. "If we could really educate people on how they affect people across the world… I think there could be much more international peace and a lot less immature fighting." Alas, while this quote from a participant highlights the main ideas of this research, it also expresses its limitations. Although these results help support the notion that college students deserve and want more education as well as believe that more education on these specific issues has the potential to do a lot of good for the world, this research does not have the ability to show what increasing education will actually do. Furthermore, this research can only be seen as a launching pad for more study. Now that we see that college students are not very aware of this issue and want to be more aware, the next step is to educate and to observe how it changes the ways the public thinks, acts, and feels towards international affairs and peacekeeping. Overall, this study revealed the need for more intensive focus on foreign and military affairs in the developed world. The world is constantly changing; international climates are always evolving; and people must know how to adjust. As addressed above in the literature review section, the growing disconnect between military action and civil society (caused by many factors, those referenced being the evolution of war and the media's influence over public opinion), has generated a growing dependence on the military and a youth desensitized to war and military intervention. This research has aimed to find solutions to combat those issues and discover ways in which we can move forward into a more peaceful, transparent world. When weighing the positive and negatives of intervening through the military, the negative consequences often seem to surpass those of the positive. Peacekeeping is a very comprehensive topic because it involves many different aspects of study and influences many groups of people. A limitation that this research encountered was the lack of time and resources to give a more in-depth analysis of peacekeeping. Nonetheless, this research's main goal was met in that this study has exposed support for increasing awareness of issues involving international relations and military action among college students. As indicated in the discussion section, this study lacks the resources to show what increasing education on these topics will actually do and how it can affect the future of peacekeeping. The next steps are to actually educate and watch as opinions change and ideas develop. Education is a powerful tool with the potential to change how stability of nations worldwide is reached. It is in our power to harness that potential and see how it affects the lives of people everywhere.